Let’s just get this out of the way: email is a mobile channel. Across virtually every industry, the majority of email activity (opens & clicks) happens on the consumer’s mobile device. Yet, because marketing emails tend to be written on desktop devices, many email marketers tend to subconsciously tailor their thinking around the desktop user — despite the fact that desktop devices account for a minority of the total audience (eMarketer). 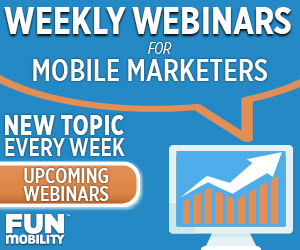 But mobile isn’t just about engaging your list after the fact. Growing your email database; collecting new opt-ins and subscribers into your list, is also highly-effective on mobile devices. Think of it like this: you’ve really got two core audiences when it comes to mobile: your “rented audience” and your “owned audience.” A key cost-saving strategy is to leverage digital experiences that allow you to convert your rented audience into your owned audience. The people seeing those ads aren’t really your audience, you’re just paying someone else for their attention. Compare that to your owned audience, which includes things like earned and organic traffic to your web and social content, SMS lists, app users, and your email database. But there needs to be something, and ideally, that something should offer instant gratification. Digital marketing programs need three pieces to be effective: Your audience (who are you reaching? ), the experience (what do you want them to do? ), and the incentive (what’s in it for them?). If you don’t offer an incentive, it’s not realistic to expect a successful campaign. 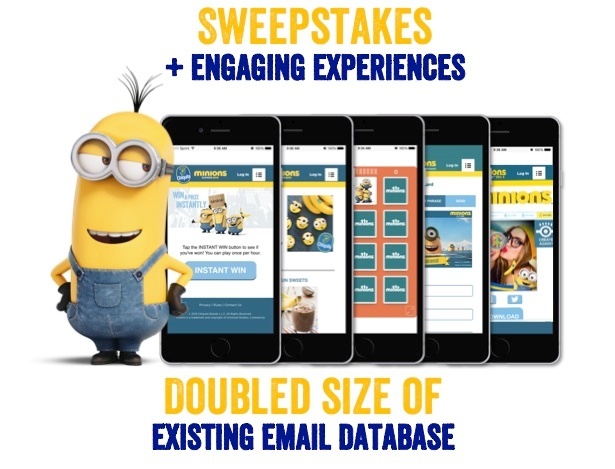 Produce giant Chiquita leveraged its partnership with Universal’s Minions film to launch an engaging digital experience to engage the community — and doubled the size of the brand’s email database in just 3 months. Visitors to minionslovebananas.com were prompted to engage with a number of activities: games, cardmakers, interactive recipes, etc. Every activity completed rewarded users with both an entree into a sweepstakes and an instant, digital prize. These digital prizes included things like digital coloring books, videos of the characters from the film, etc. — and Chiquita reward its audience with millions of prizes at virtually no added cost to the brand. This two-step incentives structure (sweepstakes and instant digital prizes) is what led to the explosive rate of newsletter opt-ins. Users were happy to provide a verified email address in return for entering the sweepstakes, and then the instant rewards/fun & engaging activities gave them such a positive experience to the brand that they also agreed to opt-in to receive the monthly newsletter. A leading apparel retail chain managed to grow its opted-in SMS database by more than 80,000 new users — a 25% increase — in just one week. The brand promoted a mobile-first gamified experience across a wide variety of digital channels. 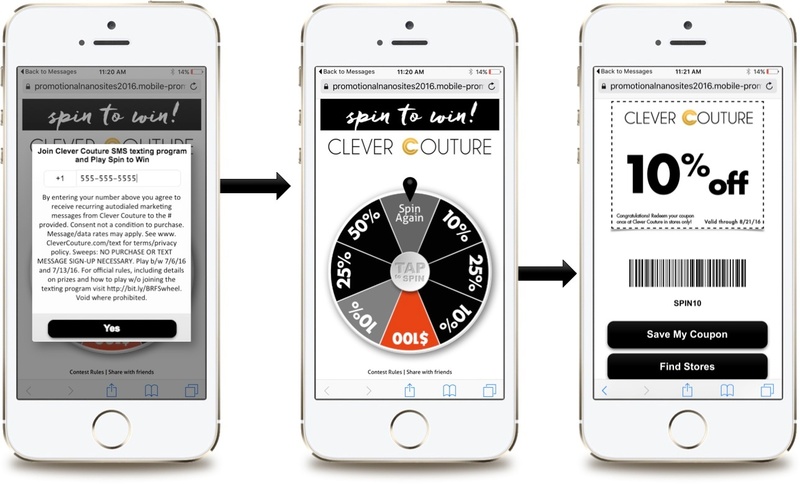 Users went through a double opt-in process to subscribe to the SMS program, and in return they were able to spin a wheel and instantly collect a single-use, high-value coupon. These coupons ranged from 10% off (most common) to a $100 gift card (extremely rare), with custom prize logic determining when and how often the different prizes were awarded to users. Each valid phone number could only access a single coupon.